This double clamp is made of anodised metal compatible with all Arca-Swiss profiels. Thus, quick release plates or long rails can be attached easily. The clamp has a 3/8 inch thread. 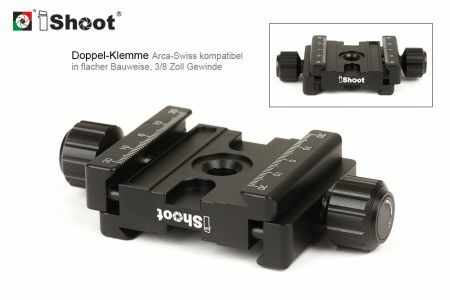 Compared to the flexible Variant this double-clamp is small and lightweight and is perfect for the mobile use with long rails like our 22cm long rail or our new 18cm double profile long rail. This Product was added to our catalogue on Wednesday 07 September, 2016.